The phone rings and it's a club owner wanting to book your band for this coming weekend to cover a cancellation. He says he has heard you are really good and have a great lead singer. This club is the hottest in town and a place you have been wanting to play for years. Of course you have to tell him that you will first need to check with your band mates to make sure everyone is available to play, but you are open those nights and confident there won't be any problem covering his cancellation. You tell the club owner you will call him back as fast as you can to confirm your booking. He tells you to be sure and do that since he has calls out to other bands too and whoever can confirm first will get the gig. You are very excited and sure that the rest of the band will be too since they have all been wanting to break into this room for a long time. Now the "fun" starts. Your first call is to your drummer who's "real" job is part time construction worker and who has 2 kids, a wife, a new house and a mortgage. He is out on a job and will have to call you back, but his wife says their daughter has a soccer game out of town Friday night so she doubts he can play. You don't panic, you call your bass player who's "real" job is an insurance agent. He answers his phone but he will also have to call you back since he is supposed to be out of town this weekend attending a convention, and he will have to ask his boss if he can skip it so he can play. At this point you are worried and a little irritated, but undaunted you place the call to your guitar player, who's "real" job is a mechanic and you know he can play, no problem. It turns out he will have to call you back too because he is out with the tow truck and the radio isn't working, so they have no way to reach him. Your last call to your female lead singer tops them all when she informs you that her new boyfriend has decided he doesn't want her to be in the band anymore because he doesn't like her being on stage with all those guys hitting on her at the gigs, so she has to quit. She informs you she is glad you called so she could go ahead and tell you, so you can let the rest of the band know she won't be singing with you anymore, effective immediately. Sound familiar? Well if it does and this is your bands situation then you are fooling yourself if you think you are going some place as a group. It ain't gonna happen and dedicating your time and effort to trying to make it happen is a gross misuse of your talent and energy, if you are really serious about your musical career. Don't fool yourself by thinking you will be fine once your band gets their big deal. Then everyone can quit their "real" jobs and play music full time, once some big music executive discovers you at Joe's Bar and Grill playing one of your 3 gigs a month in a room full of your family and closet friends, two miles from your house. Or when they hear your new record that you recorded on your computer in your bedroom, that you intend to email them as an mp3 file, while inviting them to check out your cool new website. I mean, why spend all that money going into a recording studio where you have to pay for studio time, an engineer or even a producer, when you can do it at home? And then of course you have to buy the CD's, create or have the artwork created, pay for the packaging, take a promo photo and have copies made, buy envelopes for mailing, pay the postage, and having to actually go to the post office. Such a hassle and who's gonna pay for all that anyway? You?!? When you can just do it by yourself on your computer in your bedroom for virtually free? If my words come across as negative, it is not my intention. Far from it. I intend to play music for the folks until the day I meet my maker. Keep in mind, the reason I know what I am saying is true is because I have been there many times and seen the outcome. My words are written in hopes of someone reading them avoiding making the same mistakes I have. I am totally aware of the time, hard work, sacrifice and financial burden one faces when putting it all on the line to pursue music full time for a living because I have done it. The reality is, that is just how it works and how it will always work. It falls under the heading, paying your dues. Why in the world should someone else invest in your career if you aren't willing to invest in yourself? Why should they choose you to gamble on, that's right, gamble on, from everyone else attempting to accomplish the exact same goal? We just established the fact that your band can't even get it together enough to play a local club two miles from your house. What would possibly make you think you could pull off a real tour, crossing multiple state lines and being on the road for weeks and even months at a time? 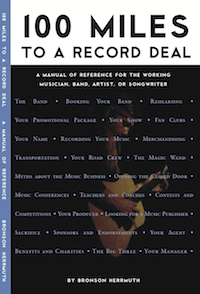 Are all of your band mates ready to quit their "real" jobs and roll the dice with you right now? I would be willing to bet you money that if I sat the majority of them down in a room and asked them that question, they would say yes, of course. As long as the moneys right. And there in lies the problem and the reason why you better find yourself a new band quick. I have worked very closely with scores of bands, artists and songwriters over the last 25 plus years, ranging from brand new to far along in their professional careers, male and female. In doing so, I have observed first hand time and time again, golden opportunities laid right in their laps and watched many of them not be able to get it together, when that chance did come. I mean no offense to any of them by stating this fact. I would never have worked with them or continue to work with them if I wasn't convinced of their talent and ability, and if I didn't love their music and care for them as individuals. Meanwhile, have you ever heard the old phrase, Be careful what you wish for? Please don't misunderstand what I am saying here. What happens over and over is when they do get their shot, they can't go. Tons of reasons, ranging from having "real" jobs, jealous spouses, children, house mortgage's, no reliable transportation, an event they had planned on attending, to their dog's sick, too far to drive, and on and on and on. Whatever the reason, they aren't able to do what is needed to enable them to take advantage of what is being offered to them, when it does get offered. End result? No deal and more times then not, a once wide open door slammed shut because they couldn't hold up on their end. But hey, what the heck. Don't worry about it. No harm, no foul. It's only your career.